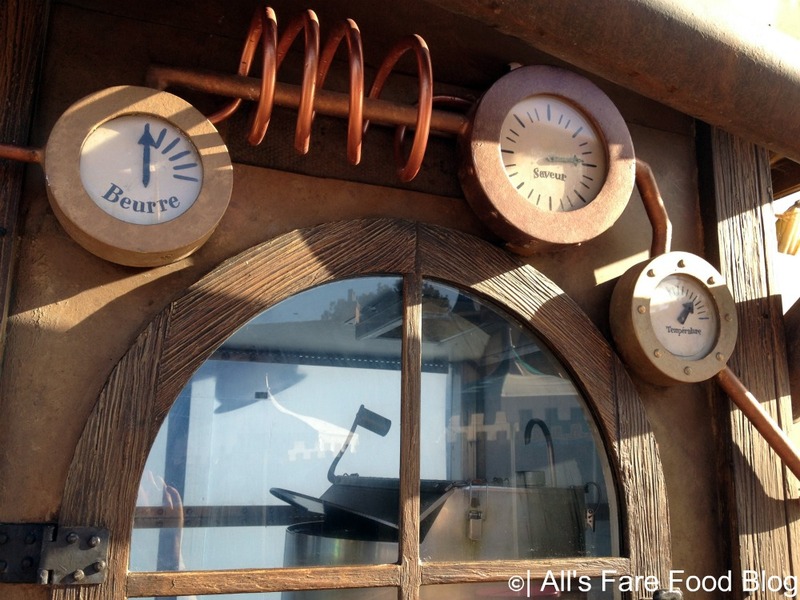 Editor’s Note: This post is a part of the Disney Blog Carnival #41. Check it out to read more things all about Disney! You still have some time to check out Disney’s “Beauty and the Beast” in theaters and in 3D. We went last weekend and it was awesome! The Oscar-nominated Best Picture still stands the test of time with its opulent dining room dance number, “Be Our Guest,” and other classic tunes that my generation grew up listening to. It reminded me of a few pictures I took while in Florida in December. Fantasyland is undergoing a HUGE development and part of it is “Beauty and the Beast” themed. Before we take a look at how the “Beauty and the Beast” theme will take shape in the new Fantasyland, let’s see how Imagineers are having fun with it. 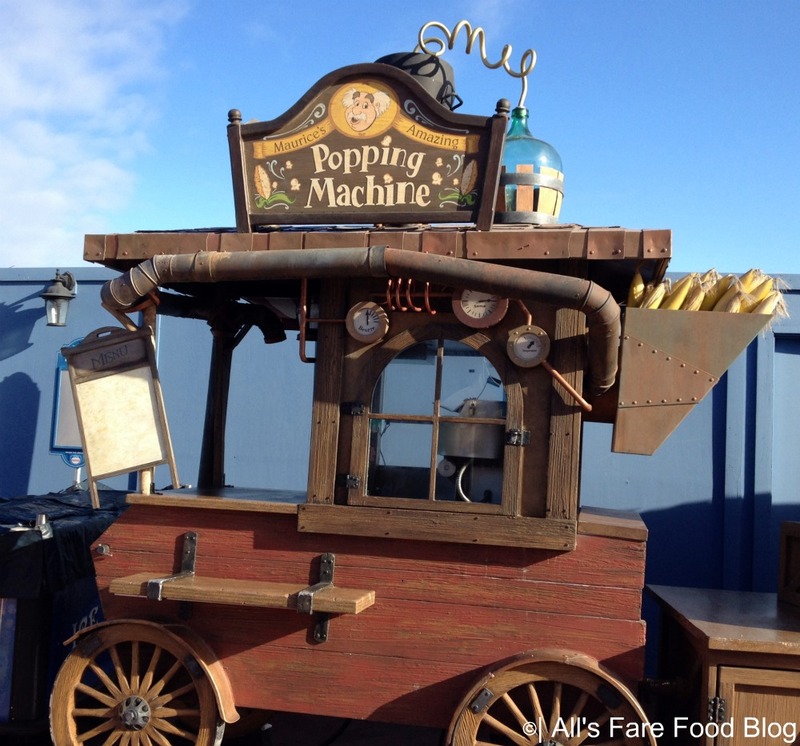 Pictured above, this popcorn cart built by Belle’s eccentric inventor father, Maurice, is quirky, yet very helpful to all the hungry tourists passing through the park. I’m always amazed at the intricate details that Disney’s Imagineers put toward their projects. From little nobs and whistles, you’re whisked away to the movieland that animators created years ago. It’s like a little piece of my childhood popped out of the moving, colorful illustrations. Huge walls, with artwork depicting what will be in place soon, surround much of the area that is currently under construction. 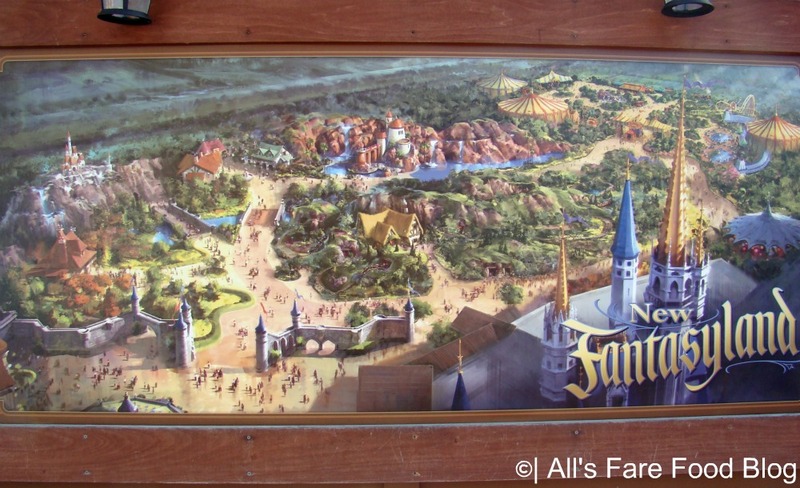 The new Fantasyland will be about two times larger. 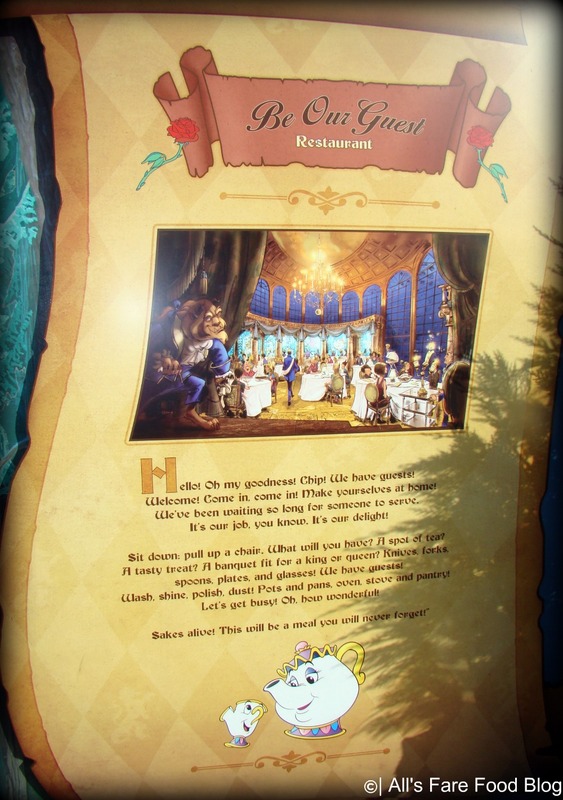 This area of Fantasyland also will include a new dining experience – the “Be Our Guest” restaurant inside Beast’s castle. This huge new restaurant in Magic Kingdom allows more than 500 guests to enjoy a meal in the mysterious west wing of Beast’s castle (where the enchanted rose is housed), in the library or gallery (for those bookworms, just like Belle and I) or the massive two-story ballroom with windows that will have a view to a bewitching wintry scene. According to Disney Food Blog, “Be Our Guest” will be a counter-service eatery during the day and a sit-down experience at dinner. It’s expected to open in late 2012, so Advanced Dining Reservations should be just around the corner. 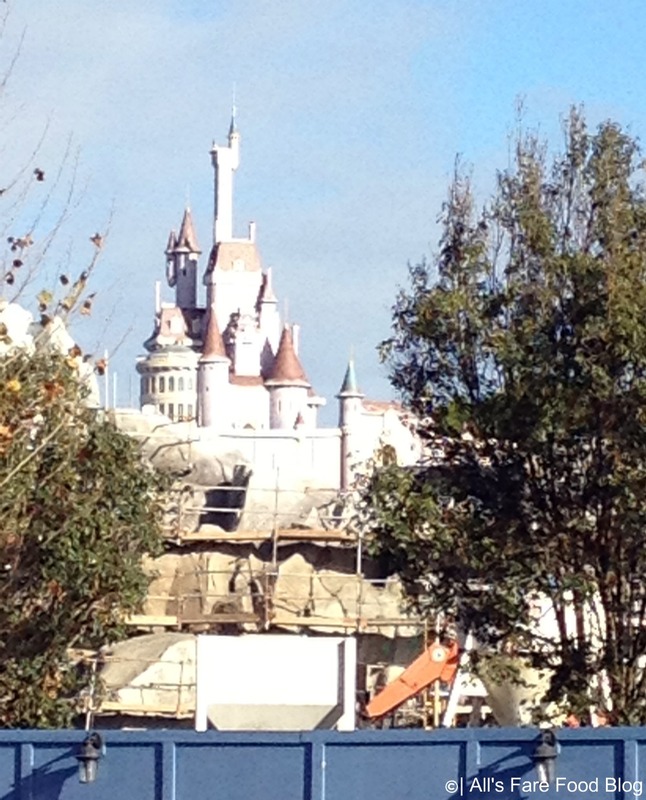 The progress of Beast’s castle (in early December 2011, above) was impressive. It will be a purely magical experience for all of the little princesses (even us big ones) to walk up to Beast’s castle and enjoy a story with Belle and Lumiere or eat next to the beautiful enchanted rose. I wonder what Walt would think of how the Magic Kingdom is growing and changing? This entry was posted in Disney World and tagged Beauty and the Beast, butterbeer, Disney World, Fantasyland, Gaston, Harry Potter, Magic Kingdom, Tavern, Universal Orlando by Christina. Bookmark the permalink. 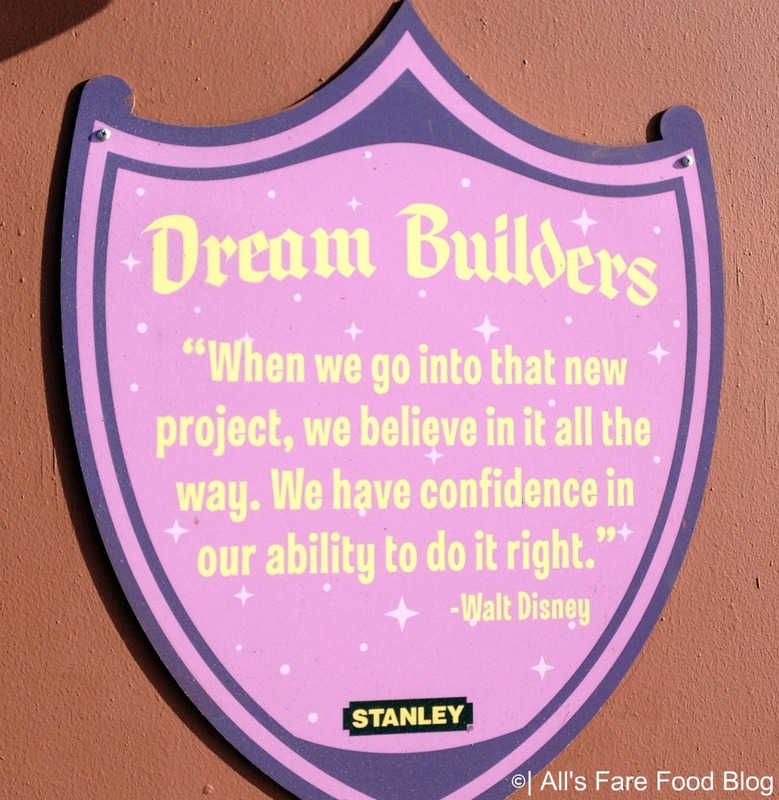 I agree, Walt was an innovator, They always want to improve their vision.